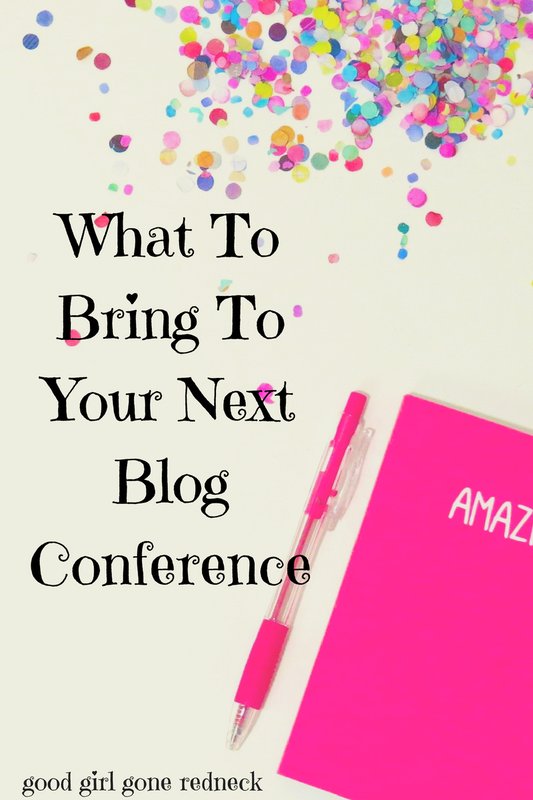 Let's be real - you're headed to your first blogging conference and you have 957 things on your mind. I hear you. I was you. I've been you. I even AM you. It's not my first conference, I've been to several. And I've even written lists like this before. So, you may be asking, why am I writing another one? I don't know - likely because I need my own current packing list - and what better place to create one than on my own blog, right? If you're like me and headed to BlogHer next week - you need to have a look at this list and determine which items apply to you - or interpret them in a way that works for you. You may find some shopping links scattered throughout this post to help you purchase what you need asap. 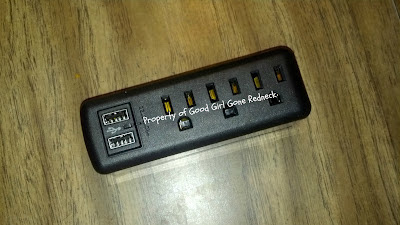 These are affiliate links and support Good Girl Gone Redneck, so thanks for using them! Yes. I do mean all of them. Bring the portable phone charger you bought at the airport that one time. And yes, I actually did this. I bought this Mophie charger and it's great. I never leave home without it - honest. Or heck, do like I did and BUY it at the airport. You know those Best Buy kiosks? They work. They're not awful, I promise. Bring the extra phone charger so you can keep one in the room and one on you at all times. If you're bringing your laptop, well, obviously - bring that charger, too. Tablet? iPad? Kindle? Bring 'em all. And if you have more than one roomie - or if you aren't trusting your chargers all that much? Get yourself a travel power strip. I don't always remember mine, but when I do it's a great thing to have on-hand. They look something like this. And no, they're not required, so don't freak if you don't have one. Just consider it if outlet space is something you worry about. Ease your mind for under $20. 2. A long-sleeved sweater or light jacket. Hotels are chilly. Conference rooms can be cold. If you're thinking, hey, Orlando in June - sleeveless and short sleeves for the win! - you're right. But when you're inside and you're wrapping your arms around yourself because you're cold? And you're looking everywhere for a cup of hot coffee or tea to warm you up? You're going to wish you listened to me. Bring that lightweight sweater. I know. You're thinking - I spent money on this conference, won't they feed me? Sure they will. Breakfast and lunch are provided. Many expo vendors will have food on-hand to treat you, as well. But don't count on those if you're the kind of person who worries about that 3PM crash or that you're going to fall asleep while listening to Ana Navarro. Bring a box of Larabars to get you through - especially if you'd rather sleep in than attend breakfast (we all know those mornings happen). Protein bars are also great for travel. We've all boarded the plane only to find out we wouldn't be taking off for another hour. Starving much? Yep. Bring all the bars, people. And bring extra. Share with your friends. Make new friends by sharing. At a conference last year I pulled out a mega-chocolate bar. I made friends with the entire table in minutes. But seriously, if you're a chocolate fan (and if you're not? Who ARE you, anyway? ), make sure you pick up a bar or two to have in your bag. Because it's a lifesaver for you and the people at your table who feel like if they don't get that afternoon coffee they're going to slide under the table and start snoring. Yes, you'll probably be able to get one at the conference. Maybe even more than one. But if you are like me and carry water with you 24/7? Bring your own. Water can be scooped up right away at conferences and it's best if you have a bottle to refill at your convenience. Yes, electronic note-taking is the way of the world today. But nothing replaces pen and paper. Most conferences are held at hotels, and most hotels offer up a pen and a notepad to their guests, but having a good pen and a notebook at the ready is a great way to jot down the important things you don't want to forget. Find yourself a fun and inspiring notebook and a really good pen and you'll use them all week/weekend long. And bring some extra pens. Your friends will thank you! This is a recent and seemingly weird addition to my list. I always have headphones for my flight, certainly, but I've started noticing that I like having them on-hand during the conference if I feel a need to zone out for a few minutes. Instead of wandering around the Expo or finding a small spot outside in a corner, I'll find that spot on a hallway couch or wherever and pop some music on for a minute or two to gather my thoughts. Yes, staying at the host hotel means you can run up to your room for a few minutes of quiet time, but having a pair of headphones with you can also help. As I said at the start of this list, it's a take-it-or-leave-it kind. No required items, just recommendations so be sure to adapt it to meet your needs. If you have them? Bring them. If you don't? Don't freak out. You can probably order some at Staples today and pick them up later. Or you can wait til you get to Orlando and do it then. You'll be okay, I promise. Consider this more of a reminder to pack them than a hey-go out and get them right now!-requirement. And if you don't have a media kit? Don't freak. I don't either. Y'all. I know. You're a pleasant person. You enjoy connecting as much as the next blogger. But watch. You get there and find yourself overwhelmed and either don't talk to anyone because you're terrified or don't connect with anyone because you're too sure of who meets your needs as far as people go and who does not. Leave it all at the door. Just be you. And bring that good attitude and outlook with you to the sessions, to the events, to the keynotes, to the sponsors. Bring it. Do it. Work it. Own it. So, whatever conference you're planning on attending? Go forth and slay! And if you'll be at BlogHer in Orlando this week/weekend? Find me and say hi. I'm friendly and I don't bite - I promise.